On Thursday, September 18, Jens Voigt will attempt to break the hour record as a final tip of the hat to the sport that has defined him for nearly three decades. With recent drastic changes to the rules governing the hour record, here’s what you should know before Voigt hits the boards. What is the hour record? 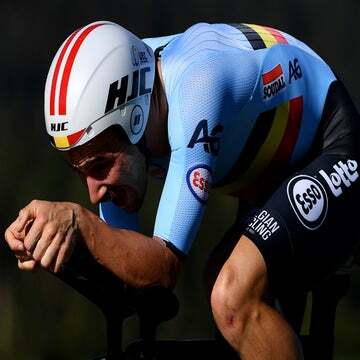 As of May of this year, the hour record is defined as the farthest distance ridden in exactly one hour using a bike and position that are legal under the UCI endurance track regulations in place at the time of the attempt. Simplified, Voigt will ride a setup that would be legal in a modern pursuit event. Riders start from a dead stop, held up by the same device used in pursuit events on the track. Voigt will have to beat Ondrej Sosenka’s distance of 49 kilometers and 700 meters, a record that was set using old rules, on an old-school bike. More on that below. The attempt will take place at the velodrome in Grenchen, Switzerland. 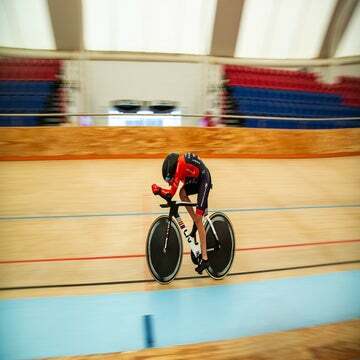 The hour record must take place on a closed velodrome. How long will it take him? Kidding aside, hour attempts usually feature a year-long (or longer) preparation period. Equipment and training all need to be dialed. Voigt’s short lead-up is quite unique. Update: Trek will live stream Voigt’s record attempt on its website at 1pm EST on Thursday. Eurosport will be broadcasting the attempt at 7 p.m. local time in Europe, or 1 p.m. Eastern in the United States. No North American broadcaster has bought rights to the event, so if you want to watch live you’ll have to find a live stream online. While VeloNews would never condone watching pirated video streams, they can be found on a variety of websites. The other option is to head to Switzerland. Tickets are still on sale. What happened to the Athlete’s Hour and Best Human Effort records? For years, the UCI recognized two different hour records. The Athlete’s Hour, also called the Merckx Hour, was performed aboard heavily regulated equipment in a very specific position. In essence, the Athlete’s Hour placed an equipment and position freeze around the late 1970s. Any rider seeking that record would ride a bike similar to the one ridden by Eddy Merckx in his record-setting 1972 ride. Another record, called the Best Human Effort, placed very few restrictions on the bike and position used. The exceptionally fast “superman” positions of Graeme Obree and Chris Boardman fall under this record. When rumors of an attempt by Fabian Cancellara began swirling earlier this year, the Athlete’s Hour was still on the rulebooks, and Cancellara would have tried to beat this record. For more on what that record looks like, read up here. In May, the UCI hit the reset button on the hour record. Both the Athlete’s Hour and Best Human Effort were scrapped in favor of a single hour record with regulations in line with modern UCI track rules. That means that as UCI track cycling rules change, so will the rules for the hour. Why does Voigt only have to beat Ondrej Sosenka? What about Chris Boardman? Tony Rominger? Graeme Obree? Chris Boardman held the Best Human Effort record with an incredible 56.376 kilometers before it was formally scrapped. But because he performed that record on a bike that is not currently UCI legal, his record does not stand under the new rules. Voigt needs to ride farther than the farthest distance ever achieved using a bike and equipment that are currently UCI-legal. Since UCI-legal track bikes of the 1990s would not be legal today, the only attempts that qualify were performed under the Athlete’s Hour rules. In other words, Voigt only needs to ride faster than riders on drop bars, spoked wheels, and skinny, non-aero frames. Rominger, Obree, and others all broke modern UCI rules in some way. Rominger, for example, used wheels that were drastically different in size, which is no longer legal. Can Jens Voigt do it? Absolutely. Voigt may not be one of the top time trialists of this era, but he’s no slouch, and the aerodynamic advantages he will have over Sosenka make it very likely that he will set a new record. Expect to see him ride in the 51-52 kilometer range. How long will he hold the record? The VeloNews crystal ball is a bit cloudy at the moment, but if one of the big names in time trialing — say, Fabian Cancellara, Tony Martin, or Bradley Wiggins — takes a real swing at the record, Voigt would likely lose it. He’s said that much himself, but even if he’s only the record holder for a year, that’s quite a way to say goodbye to the sport. If Voigt was serious about hanging onto the record for any great length of time, he would likely make his attempt at altitude, where aerodynamic drag is decreased slightly. The preferred track is near Mexico City; that’s where Merckx set his record in 1972. How hard is the hour record attempt? They call it “the longest hour” for a reason. Eddy Merckx described being afraid to move, to blink, lest it throw off the rhythm, or cause the lapse in concentration that could be the distinction between success and failure. Nothing, not a thing, can be allowed to grab the focus, break the concentration. It’s the ultimate test of not only the body but of the mind. Voigt will ride a modified frame from his sponsor, Trek. It is based around the company’s Speed Concept time trial frame, but with modified rear dropouts to accept a narrower 120mm track wheel. With no hills or wind to contend with, Voigt’s bike will have no brakes and will be a fixed gear. He will likely run a 54-tooth chainring and 14-tooth rear cog. A fixed gear is marginally more efficient than a derailleur setup as it removes the drag produced by both the articulation of the chain through the derailleur pulleys and the friction inside the pulley bearings themselves. Trek can’t make huge modifications to the frame without running afoul of the UCI’s frame approval program, and the timeline for this attempt has been too tight for a purpose-built frame. That presents a few technical issues, as road bikes and track bikes are built with very different chainlines. Voigt will ride a standard Dura-Ace crankset with a 54-tooth chainring, which sits further outboard than a traditional track chainring. As a result, Trek and Shimano have collaborated to build special cogs that sit further outboard as well, to keep the chain straight. Voigt will run front and rear disc wheels. This change alone presents a massive aerodynamic advantage over the riders on Athlete’s Hour setups. Voigt will also ride with an SRM power meter, just as he does on the road. Track riders can’t look at their power during events, and it’s not clear whether Voigt will be allowed to pace with power, or be forced to leave the computer under his saddle. 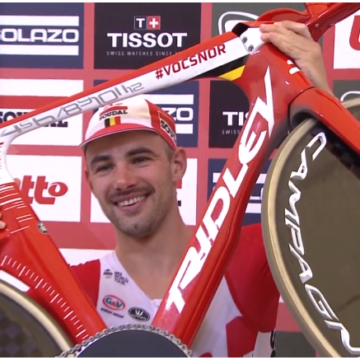 Can he use other aero equipment? Yes, he can use anything that is UCI legal. The UCI recently changed position rules to allow tall riders (over 190cm) to stretch out a bit more, so Voigt has adjusted his position accordingly. He is apparently now faster than ever in the time trial bars. Trek had Voigt do aero testing in June and used that time to select both hardgoods and items like his skinsuit and helmet. Why did Cancellara back out? Cancellara was widely rumored to be working on a record attempt, but scrapped that plan when the UCI changed the rules. It seems he was more interested in comparing himself directly to the likes of Merckx and Boardman (who rode 49.441 kilometers when he attempted the Athlete’s Hour). Frankly, given the aerodynamic advantages conferred upon the first rider to attempt the record under the new rules, Cancellara likely didn’t see it as much of a challenge.